As we have recently returned from a few weeks in Scotland where we spent much of the time searching for and watching otters, and as they are also one of my favourite animals for sculpture, I thought that I would make otters the subject of my first blog. Otters are elusive creatures, once teetering on the brink of extinction in the UK. However, they are now making a good come back. Otters are beautiful and interesting creatures to watch in the wild (I never tire of watching them) – and I love to sculpt them. In the water their bodies are sleek and graceful and otter sculptures look beautiful in both bronze and plywood. On this trip I managed to capture a few images I am quite pleased with. In the photo below you can even see the webbed feet. When I first actively started looking for otters for reference gathering purposes (rather than just coming across them accidentally) I actually saw very few. I might see some tracks, hole myself up somewhere for hours (often in high winds and rain) and would see precisely nothing. Now when we go searching (these days I usually have the company of my wife Lesley) I would say that around half the time we are successful. It must be said that we do put in quite a lot of effort, picking our way around miles of the rugged Scottish coast, across rocks, along beaches; sitting in all weathers, gazing and waiting. But it often pays off. This is in part due to our increased knowledge (looking for signs of otters, and targeting areas in which we know otters have been) but it is probably also due to there simply being more otters, which is fantastic. 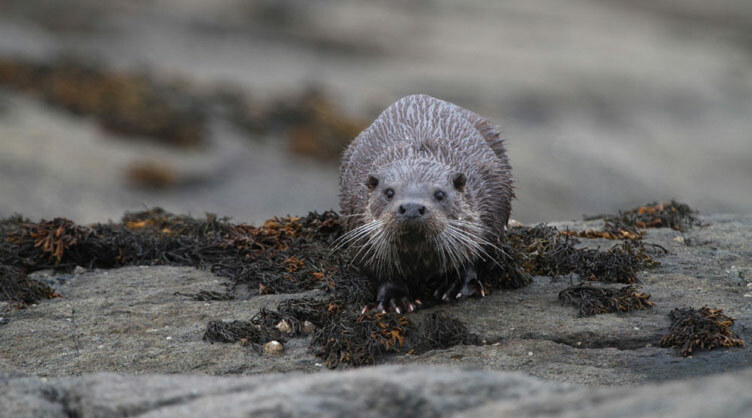 Otters are also now in every county in the UK (ironically Kent, where we live, was the last county to be populated by otters in 2011) but the inland otters are rather more difficult to see – certainly where we live. But they are becoming bolder and if you have a river near you, it is worth keeping your eyes peeled – you may just see one swimming under a bridge!